Is there a better alternative to MasterKick? Is MasterKick really the best app in Sports category? Will MasterKick work good on macOS 10.13.4? MasterKick is a table soccer game with various playfields and players, weather visual effects, or live cheering. 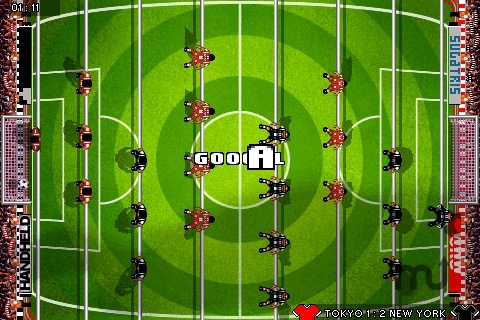 Master kick gives you the full atmosphere of soccer match combined with foosball skill. Highly sophisticated AI plus numerous formations selection, playing in a league or quick match will not fail any soccer fan expectations. Great dynamic music and sound powered by MODULA Audio Engine and fullscreen support enlarge the overall game experience. One thing is for certain, MasterKick tried once, will become your favorite addiction! Added ability to save the game state in case user quits the game while playing quick match or league. Next time game is started it continues where stopped the last time. MasterKick needs a rating. Be the first to rate this app and get the discussion started! Features: Great Atmosphere, Addictive Gameplay, Amazing Visual Effects, Six Playfields / Six Teams, Vivid Sound Effects And Music, Action Replays, In English, German, French, Spanish, Portuguese, Italian, Norwegian, Swedish, Finnish, Dutch, Danish, Polish, Hungarian and Serbian And Much More!!! MasterKick is available for iPhone / iPod Touch, Windows Mobile, Palm OS mobile devices and Windows XP/Vista, Linux and Mac OS X computers.